Lucerne is a small city and so is easy to explore in a day. 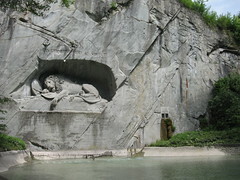 The main tourist attraction is Löwendenkmal, the Lion Monument, and is only a short walk out of the main shopping and business area of Lucerne. The monument was carved to ‘commemorate the hundreds of Swiss Guards who were massacred in 1792 during the French Revolution, when the mob stormed the Tuileries Palace in Paris’ (www.wikpedia.org). The monument is very sad as the dying lion has such a mournful expression and the symbolysm of the courageous lion says much more than a statue of a man could. The rest of the afternoon was spent weaving our way through the small streets of old Lucerne now lined with shops and cafes. Many of the buidling facades are colourfully painted and the charm is emphasised by the wooden bridges crossing the river to the modern side of Lucerne. This one is called Chapel Bridge and is apparently one of the most photographed items in all of Switzerland. The city is clean, safe and very easy to get around. The people are friendly and do not hesitate in helping us with a our poor Swiss German. Wendelin has taught us how to count to ten and say hello which has helped us no end. Lucerne is by far the nicest city we have visited in Europe, not the biggest and does not have a million tourist attractions, but for these two travellers it was a welcomed rest and haven. Tomorrow though we go further afield as Wendelin is taking us on a hike through the mountains – I am off to find my Heidi costume.